The Dark Peak isn't sure it likes us. This was our 3rd visit, having previously done Lord's Seat and Kinder Scout. Reaching Lord's Seat in January we experienced near gale force winds and poor visibility and I said how nice it would be to return in the summer weather for a different experience. Kinder Scout in February saw -3 degrees on the summit at midday. So when we arrived on Friday we were amazed to find it bathed in sunshine. Would it last? No such luck! Descending into the valley past Mam Tor we'd forgotten how magnificent that first sight is and how it continues to wow you right up until you go home. We'd picked out the Greenacres camp site at the opposite end of the valley to our previous trips. Nestled underneath Back Tor, it was a great location for our walk. We had a few fellow campers on Saturday night but it was still peaceful and private and great value. Friday afternoon we just had time to get down into Castleton and catch the last tour of the Peak Cavern. Also known as the Devil's Arse, for the noises made by the water in the cave, it has the largest cave entrance in Britain. Until the mid 20th century it was used by ropemakers and one of their cottages can still be seen. I think I'd rather stick to the tent and my Pacific Outdoor sleeping mat any day! The tour guide was brilliant and really made the tour. The Peak Cavern used to be at the heart of industry with rich folk coming for the tour, including Queen Victoria. They would be lucky to see much, often not having more than a candle for light. They had to enter the main cavern laying in a coffin shaped boat. They were then carried over the wet cave floor by the ropemakers before being “sung” to in the dark by the children hiding overhead. All in all they thought they were descending into the depths of hell. Saturday morning (after breakfast of course!) 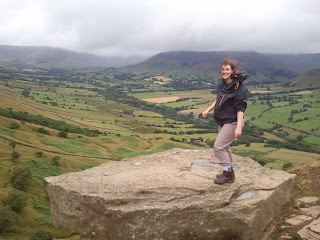 we set out along the road towards Edale and then headed up Back Tor lane, past the farm. The hedgerows provided a delicious mid morning snack of wild raspberries, smaller but so much tastier than the raspberries from the supermarket. Up on the top the wind picked up and I can tell you I didn't stand on the rock for too long looking at the view before relievedly getting back down! We continued on along to Lose Hill which has views of Hope and across towards the Ladybower reservoir. As we turned back the storm, that had been threatening all morning, broke and we sheltered at the edge of Back Wood, under an umbrella, eating cheese and marmite and Pringle sandwiches. 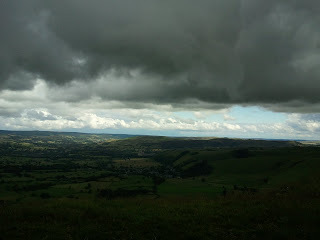 On along the top to Mam Tor, the site of an Iron Age fort and should you want a longer walk you could continue on along Rushup Edge and Lord's Seat. We turned back and headed down Hollins Cross towards home. Once again, we had a fantastic weekend. One final thing...don't miss a drive through Winnats Pass, a steep sided craggy valley where you can imagine bandits holding you up as you pass through. I made plans to visit here once, but the weather it was the weather that didn't like us. Lucky though, because later that week there was a flash flood and some campers got trapped (ended up OK).